This article is about the historical event. For other uses, see Baptism of Jesus (disambiguation). The baptism is one of the five major milestones in the gospel narrative of the life of Jesus, the others being the Transfiguration, Crucifixion, Resurrection, and Ascension. Most Christian denominations view the baptism of Jesus as an important event and a basis for the Christian rite of baptism (see also Acts 19:1–7). In Eastern Christianity, Jesus' baptism is commemorated on 6 January (the Julian calendar date of which corresponds to 19 January on the Gregorian calendar), the feast of Epiphany. In the Roman Catholic Church, the Anglican Communion, the Lutheran Churches and some other Western denominations, it is recalled on a day within the following week, the feast of the baptism of the Lord. In Roman Catholicism, the baptism of Jesus is one of the Luminous Mysteries sometimes added to the Rosary. It is a Trinitarian feast in the Eastern Orthodox Churches. Mark, Matthew, and Luke depict the baptism in parallel passages. In all three gospels, the Holy spirit is depicted as descending upon Jesus immediately after his baptism accompanied by a voice from Heaven, but the accounts of Luke and Mark record the voice as addressing Jesus by saying "You are my beloved Son, in whom I am well pleased", while in Matthew the voice addresses the crowd "This is my beloved Son, in whom I am well pleased" (Matthew 3:13–17; Mark 1:9–11; Luke 3:21–23). After the baptism, the Synoptic gospels describe the temptation of Jesus, where Jesus withdrew to the Judean desert to fast for forty days and nights. In Matthew 3:14, upon meeting Jesus, John said: "I have need to be baptized of thee, and comest thou to me?" However, Jesus convinces John to baptize him nonetheless. Matthew uniquely records that the voice from heaven addresses the crowd, rather than addressing Jesus himself as in Mark and Luke. Mark's account is roughly parallel to that of Matthew, except for Matthew 3:14-15 describing John's initial reluctance and eventual consent to baptize Jesus, which is not described by Mark. Luke 1 begins with the birth of John the Baptist, heralded to his father Zacharias by the angel Gabriel. Six months later Gabriel appears to the Virgin Mary with an announcement of the birth of Jesus, at the Annunciation. At the same, Gabriel also announces to Mary the coming birth of John the Baptist, to her kinswoman Elizabeth, who is the wife of Zacharias. Mary immediately sets out to visit her kinswoman Elizabeth, and stays with her until John's birth. Luke strongly contrasts the reactions of Zacharias and Mary to these two respective births; and the lives of John and Jesus are intertwined. Luke uniquely depicts John as showing public kindness to tax collectors and encouraging the giving of alms to the poor (as in Luke 3:11). Luke records that Jesus was praying when Heaven was opened and the Holy Spirit descended on him. Luke clarifies that the spirit descended in the "bodily form" of a dove, as opposed to merely "descending like" a dove. In Acts 10:37–38, the ministry of Jesus is described as following "the baptism which John preached". Jesus (left) is being identified by John the Baptist in John 1:29. by Vannini, 17th century. In John 1:29–33 rather than a direct narrative, John the Baptist bears witness to the spirit descending like a dove. The Gospel of John (John 1:28) specifies "Bethabara beyond Jordan", i.e., Bethany in Perea as the location where John was baptizing when Jesus began choosing disciples, and in John 3:23 there is mention of further baptisms in Ænon "because there was much water there". John 1:35–37 narrates an encounter, between Jesus and two of his future disciples, who were then disciples of John the Baptist. The episode in John 1:35–37 forms the start of the relationship between Jesus and his future disciples. When John the Baptist called Jesus the Lamb of God, the "two disciples heard him speak, and they followed Jesus". One of the disciples is named Andrew, but the other remains unnamed, and Raymond E. Brown raises the question of his being the author of the Gospel of John himself. In the Gospel of John, the disciples follow Jesus thereafter, and bring other disciples to him, and Acts 18:24–19:6 portrays the disciples of John as eventually merging with the followers of Jesus. According to the non-canonical Gospel of the Nazarenes, the idea of being baptized by John came from the mother and brothers of Jesus, and Jesus himself, originally opposed, reluctantly accepted it. Benjamin Urrutia avers that this version is supported by the Criterion of Embarrassment, since followers of Jesus would not have invented an episode in which Jesus changes his mind and comes to accept someone else's plan. Plus, the story came from the community that included the family of Jesus, who would have guaranteed the authenticity of the narrative. The Gospel of John (John 3:23) refers to Enon near Salim as one place where John the Baptist baptized people, "because there was much water there". Separately, John 1:28 states that John the Baptist was baptizing in "Bethany beyond the Jordan". This is not the village Bethany just east of Jerusalem, but is generally considered to be the town Bethany, also called Bethabara in Perea on the Eastern bank of the Jordan near Jericho. In the 3rd century Origen, who moved to the area from Alexandria, suggested Bethabara as the location. 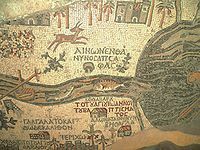 In the 4th century, Eusebius of Caesarea stated that the location was on the west bank of the Jordan, and following him, the early Byzantine Madaba Map shows Bethabara as (Βέθαβαρά). The biblical baptising is related to springs and a Wadi (al-Kharrar) close to the Eastern site of the Jordan River, not the Jordan itself. The pilgrimage sites, important for both Christians and Jews have shifted place during history. The site of Al-Maghtas (baptism, or immersion in Arabic) on the East side of the River in Jordan has been deemed the earliest place of worship. This site was found following UNESCO-sponsored excavations. Al-Maghtas was visited by Pope John Paul II in March 2000, and he said: "In my mind I see Jesus coming to the waters of the river Jordan not far from here to be baptized by John the Baptist". The Muslim conquest put an end to the Byzantine buildings on the east bank of the Jordan River, the later reverence took place just across the river in the West Bank at Qasr el Yahud. In the fifteenth year of the reign of Tiberius Caesar—when Pontius Pilate was governor of Judea ... , the word of God came to John son of Zechariah in the wilderness. There are two approaches to determining when the reign of Tiberius Caesar started. The traditional approach is that of assuming that the reign of Tiberius started when he became co-regent in 11 AD, placing the start of the ministry of John the Baptist around 26 AD. However, some scholars assume it to be upon the death of his predecessor Augustus Caesar in 14 AD, implying that the ministry of John the Baptist began in 29 AD. The generally assumed dates for the start of the ministry of John the Baptist based on this reference in the Gospel of Luke are about 28–29 AD, with the ministry of Jesus with his baptism following it shortly thereafter. Stained glass window of Jesus' baptism by Tiffany. Most modern scholars believe that John the Baptist performed a baptism on Jesus, and view it as a historical event to which a high degree of certainty can be assigned. James Dunn states that the historicity of the baptism and crucifixion of Jesus "command almost universal assent". Dunn states that these two facts "rank so high on the 'almost impossible to doubt or deny' scale of historical facts" that they are often the starting points for the study of the historical Jesus. John Dominic Crossan states that it is historically certain that Jesus was baptised by John in the Jordan. In the Antiquities of the Jews (18.5.2) 1st-century historian Flavius Josephus also wrote about John the Baptist and his eventual death in Perea. The existence of John the Baptist within the same time frame as Jesus, and his eventual execution by Herod Antipas is attested to by 1st-century historian Flavius Josephus and the overwhelming majority of modern scholars view Josephus' accounts of the activities of John the Baptist as authentic. Josephus establishes a key connection between the historical events he recorded and specific episodes that appear in the gospels. The reference in the Antiquities of the Jews by Josephus to John's popularity among the crowds (Ant 18.5.2) and how he preached his baptism is considered a reliable historical datum. Unlike the gospels, Josephus does not relate John and Jesus, and does not state that John's baptisms were for the remission of sins. However, almost all modern scholars consider the Josephus passage on John to be authentic in its entirety and view the variations between Josephus and the gospels as indications that the Josephus passages are authentic, for a Christian interpolator would have made them correspond to the Christian traditions. One of the arguments in favour of the historicity of the baptism of Jesus by John is that it is a story which the early Christian Church would have never wanted to invent, typically referred to as the criterion of embarrassment in historical analysis. Based on this criterion, given that John baptised for the remission of sins, and Jesus was viewed as without sin, the invention of this story would have served no purpose, and would have been an embarrassment given that it positioned John above Jesus. The Gospel of Matthew attempts to offset this problem by having John feel unworthy to baptise Jesus and Jesus giving him permission to do so in Matthew 3:14–15. The gospels are not the only references to the baptisms performed by John and in Acts 10:37–38, the apostle Peter refers to how the ministry of Jesus followed "the baptism which John preached". Another argument used in favour of the historicity of the baptism is that multiple accounts refer to it, usually called the criterion of multiple attestation. Technically, multiple attestation does not guarantee authenticity, but only determines antiquity. However, for most scholars, together with the criterion of embarrassment it lends credibility to the baptism of Jesus by John being a historical event. While the gospel of Luke is explicit about the Spirit of God descending in the shape of a dove, the wording of Matthew is vague enough that it could be interpreted only to suggest that the descent was in the style of a dove. Although a variety of symbolisms were attached to doves at the time these passages were written, the dove imagery has become a well known symbol for the Holy Spirit in Christian art. Depictions of the baptismal scene typical show the sky opening and the Holy Spirit descending as a dove towards Jesus. The reformer Martin Luther wrote a hymn about baptism, based on biblical accounts about the baptism of Jesus, "Christ unser Herr zum Jordan kam" (1541). It is the basis for a cantata by Johann Sebastian Bach, Christ unser Herr zum Jordan kam, BWV 7, first performed on 24 June 1724. ^ Guy Davenport and Benjamin Urrutia, The Logia of Yeshua / The Sayings of Jesus (1996), ISBN 1-887178-70-8 p. 51. ^ "Wo Johannes taufte". ZEIT ONLINE. Rosemarie Noack. 22 December 1999. Retrieved 9 December 2015. ^ Staff writers (28 July 2011). "Israel will reopen (Israeli) site of the baptism of Jesus". AsiaNews.it. Retrieved 31 July 2011. ^ "No evidence, but UN says Jesus baptized on Jordan's side of river, not Israel's". Times of Israel. 13 July 2015. Retrieved 26 November 2015. ^ Albright, W.F. and C.S. Mann. "Matthew". The Anchor Bible Series. New York: Doubleday & Company, 1971.